Snow had fallen the night before. Previously covered roads were now cleared completely. Or so it seemed. We were warned to look out for black ice before gearing up for our weekly long run. Mounds of snow lined the edges of the road. The path ahead looked safe, yet patches of black ice couldn’t be detected with the naked eye. A few runners up ahead were in their perfect stride, their eyes fixed ahead, when suddenly one of them slipped! She tried furiously to catch herself. Yet her attempt was futile. Bam! Spinning out of control, she fell onto the frozen ground. Shaken, she slowly stood up, caught her breath and continued—at a much slower pace. Nobody could see the culprit. That sneaky patch of black ice, lurching in the shadows. She didn’t know it was there until it was too late. Black ice. Why is it called this? If it were black, wouldn’t one be able to see it? 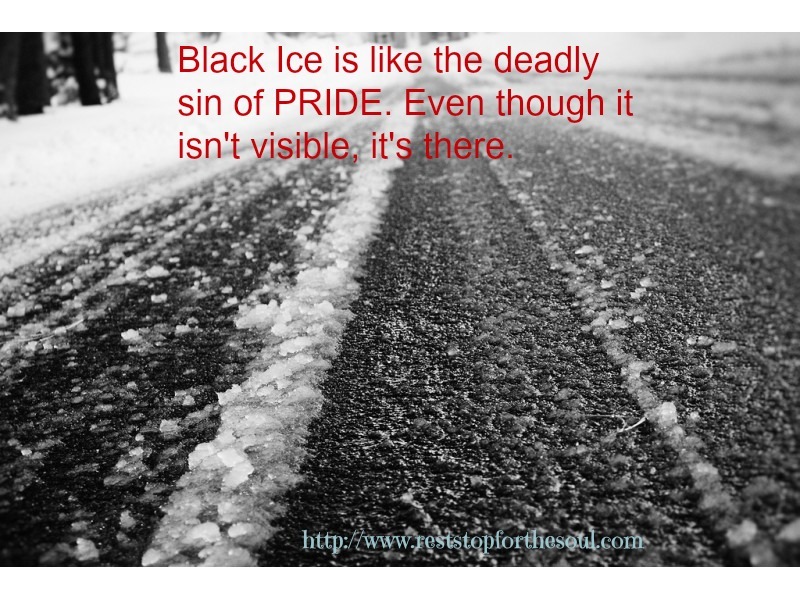 But by definition, black ice refers to a thin coating of glazed ice on a surface. Because of its transparency, it allows black asphalt roadways to be seen through it. It’s practically invisible to drivers as well as runners, causing a risk of skidding and accidents due to the loss of traction. Isn’t black ice kind of like those sins we hold onto sometimes? Not the outward ones obvious to most. No, I’m referring to the ones that are embedded deep within us. Those secret sins we try to keep hidden. To the naked eye, they can’t be detected. On the outside we may look polished, presentable and perfect. But deep inside there’s a losing battle with an ugly thing called pride. Although it can’t be seen, pride will rear its ugly head out of nowhere when least expected and before we know it, we’re sliding. Skidding. Losing our balance. We try with all our human might to catch ourselves. Just like the runner I witnessed. But most often we come to an abrupt halt and crash humbly to the ground. Pride comes before a fall. Just when we think we’ve paced ourselves with our perfect stride, patting ourselves on the back for all we think we’ve done in our own power, that’s when we’re most susceptible to the black ice of pride. I’m not like that person. I’m better than he is. I haven’t given in to the sin she struggles with. We blow ourselves up with such powerful pride that we don’t even see the ground beneath us. We don’t see the danger of what’s ahead. Pride is such a deadly sin because it takes our eyes off Jesus and puts the focus on self. Instead of going at the pace designed for us, we do things our own way and suddenly we lose traction, falling to the ground. READY? Do you ever find yourself pointing out obvious sins of others? Why are we so quick to do so? Are there areas of your own life where God is pointing out pride? Are you willing to humble yourself and surrender before you fall? Ask him to shine his light on your pride. GET SET. Proverbs 11:2 When pride comes, then comes disgrace, but with humility comes wisdom. GO! Heavenly Father, please forgive me for the times I’ve judged others for outward sins when I’ve neglected to see the pride in my own heart. Help me to keep my eyes on you one step at a time so I can be aware of anything that would cause me to fall. Thank you for your grace. Such a great reminder, Lisa, that we need to depend on Jesus and be in the word every single day or else we will slip and fall. Yes, this is a hard truth to learn sometimes!